Joseph Leon Russo passed away peacefully on Thursday, January 24, 2019 at the age of 88. He is survived by his beloved wife of 63 years, Gladys Usey Russo. He is also survived by his children: Mitchell Russo, Keith Russo (Cynthia), and Cathy Russo Carter (George); his grandchildren: Jeffrey Russo, Megan Carter, Peyton Russo, and Garrett Russo; and many nieces, nephews, cousins, and friends. 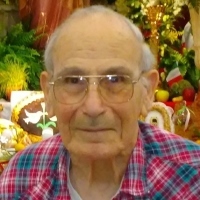 He was preceded in death by his parents, Luminato Russo and Bena Figaro Russo; his son, Daniel Russo; and his siblings, Virginia Canova, John Russo, and Michael Russo. Joseph was retired after 20 years of service from the U.S. Navy Reserve as a Chief Petty Officer. He graduated from Delgado Community College with two Associate Degrees. Relatives and friends are invited to attend the Funeral Services at Garden of Memories Funeral Home, 4900 Airline Drive in Metairie, LA on Tuesday, January 29, 2019. Visitation will begin at 12:00 pm with the service starting at 2:00 pm followed by burial in Garden of Memories Cemetery.